Late last week I got another new ruler and a fat pack of fabric that I had been drooling over for a while. The ruler I like very much, but the fabric was a big disappointment to me. While it looked wonderful on the website where I bought it, when it arrived here at the Squash House it didn't look at all like I thought it would in person. Has this ever happened to you? Now I'm sure in many people's eyes, Hickory House by Faye Burgos for Marcus Brothers is absolutely gorgeous and they are going to make some stunning quilts from it. It's all in the eye of the beholder! For me, it just didn't do it. So, I thought why not try using it with the new ruler -maybe once it's sewn into blocks I'll fall in love with it once again. Here are the red and cream fat quarters sewn into Kaleidoscope blocks using my new ruler - the Kaleidoscope Smart Plate by Sharon Sebrow. (In another post I'll have a tutorial for using this ruler.) Unfortunately, this still doesn't make me love the fabric. So, I'll put these in a bag for now and figure out what I might use them for another time - maybe potholders! So today I decided to make Lemonade! You know the old saying "When life hands you lemons, make lemonade"! It got out my fat 1/8th pack of Blackbird Designs Blueberry Crumb Cake and began making blocks for Stephanie's new Wringer Washer pattern! I just know this is going to be a gorgeous quilt! Mr. Squash and I were all ready to leave for a few days in Portland today when he came down with a bad cold. We had planned to do some antiquing, have dinner with friends who live there and perhaps drag Mr. Squash to visit a few quilts shops! So we rescheduled for next week, which gives me a few more days to work on Wringer Washer. Hope Mr Squash feels better soon. I have a rotten cold too and it's no fun. But, your trip next week will be a blast, can't wait for pictures! I guess that is why they have so many fabric lines, but the red and white doesn't do it for me either. I need to get some Blueberry Crumb Cake before it is all gone. I like your red & cream blocks, I think they are gorgeous and the Blueberry crumb cake.. well what can I say I just love both of your projects. I'm quite partial to Blueberry Crumb Cake and well I love it in Wringer Washer. :o) Perhaps a charity quilt with your Hickory House? Potholders are great too. Looking forward to the ruler tutorial. Feel better Mr. Squash. I bought some Hickory House online as well...the large prints with some neutral for backing and stripes for border...at time I thought they would be really cute pillows. Like you sight unseen and on the web looked so pretty....I'm not near as in love with it now that I have it here in person. I hope that I can make something with with it that I like. 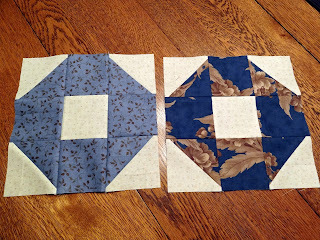 The Blueberry Crumb Cake fabrics look delicious, I can't wait to see the finished quilt. I hope Mr. Squash will soon feel better. Until recently I had access to a magnificent quilt shop wo I bought all of my fabric there. Since they closed I have made one fabric purchase online (from the Fat Quarter Shop) and wasn't disappointed. However, I am new to the online shopping thing for fabric. I'm really a touchy feely kind of person. Love the Blueberry Crumb Cake and your blocks are perfectly stitched...as usual! Hope Mr. Squash feels much better soon and you can go on your trip! What a shame about your trip. At least you can look forward to it next week. I love your Kaleidoscope blocks, and the fabric. To me they say "Christmas", and the Blueberry Crumb fabric looks wonderful. I feel a virtual shopping trip coming on. That's happened to me, too. 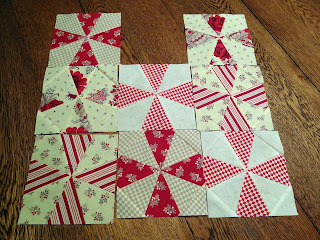 Sorry the fabric wasn't your cup of tea, but the blocks sure are cute! I love the blue and browns in Blueberry Crumb Cake. Sending feel better vibes to Mr. Squash. I was looking at your pictures and was wondering what a quilt top would look like using these two collections together somehow. Bet with a little creativity, it would work! I really like Blueberry Crumb Cake. All of your blocks look great! Your Wringer quilt will be beautiful in the Blueberry Crumb fabrics! I too have purchased a fabric collection in the past & been disapointed. Perhaps you could trade the blocks with another quilter. Hope your hubby is feeling better soon! I agree with you about the red blocks. Something is wrong. I think the reds are OK. But the cream backgrounds don't seem right. Makes it all too busy. But I do like the block design. I like your new fabric. Looks Christmasy. I like your washer blocks too. I hope to make Stephanie's green bean pattern this summer. Hope Mr. S is feeling much better today. I like the Hickory House, especially that red stripe. I don't usually buy fabric online; I'm too much of a mixer-matcher. I like your blue blocks a lot. That will be gorgeous!